I’ve got a very chequered history with pastry. Sometimes, it works out OK, but not perfect, other times it’s a complete disaster. The number of times the pastry has shrunk back from the rim of the tin, leaving a flat disk of insipid pastry with a slightly upturned lip, is uncountable. That flat disk with the half-hearted sides, collapsing in on themselves under the sheer pathetic effort of standing up straight, is my pastry signature. I’ve tried plenty of methods and recipes, and I’d favoured Jamie Oliver’s ‘push it into the tin and freeze the lot’ method for a long time, on the basis that the recipe does two tins, so there’s a standby in the freezer in the event of the inevitable disappointment. Never have I managed to produce a pastry case with sides that cling bravely to the top of the tin. Some have come close, but close isn’t good enough. I don’t know if it’s the recipe itself that led to success, or a freak cosmic alignment of the planets or some form of divine intervention, but the results today were extremely – freakishly -good. The filling for this outstanding pastry case was pecan nuts and lots of sugar, but that almost seems irrelevant, given the fact that the pastry worked. So, here’s how to make a superb sweet pastry case. If you’re lucky. Weigh out 150g of butter and 100g of caster sugar and cream them together in a food processor until pale and smooth. You could do this by hand, but there are better things to do with your time. Mix a large egg and an extra yolk into the butter and sugar. Make sure all of the egg is incorporated, then sift over 270g of plain flour, pulsing it together quickly into a ball. Don’t overdo it…just quick, light actions, just enough to draw the pastry together. Wrap the ball of pastry in clingfilm and rest it in the fridge for at least half an hour, then roll it out so that its big enough to fit into a 25cm fluted tart case. Butter the tin well and gently lift the pastry into it, easing it into the bottom and against the sides. Press it into place and trim the top with a sharp knife so that it’s flush. Rest the lined tin in the fridge for another half an hour, and heat the oven up to 160c. Line the chilled pastry tin with greasproof paper, then fill with baking beans, rice or whatever to weigh the pastry down and stop it from rising. Cook for twenty minutes, then take the beans/rice out and cook for a further five minutes so that the pastry is a nice golden colour. Melt 50g of butter in a small pan with 225g of golden syrup, and mix in a couple of tablespoons of caster sugar. In a small bowl, whisk two large eggs together with a teaspoon of cornflour, then add the egg mixture to the butter and golden syrup, mixing together well. 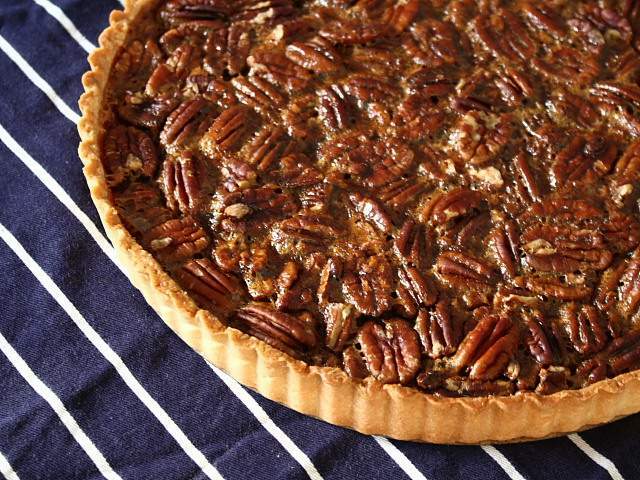 Spread 200g of pecan nuts evenly over the bottom of the cooked and cooled pastry case, then pour the golden syrup mixture over. Be careful not to let any of the mixture tip over the top of the case…it’ll weld the pastry to the tin, making it nearly impossible to remove the finished tart from the tin. The filling might look a little scant. Don’t worry – it’ll rise up to fill the pastry as it cooks. Bake at 160c for forty minutes, turning around halfway through. Eat either hot or cold, with vanilla ice cream. I have a debilitating fear of pie crusts due to numerous failures. I’ll just have to muster my courage and give this one a try. Keeping my fingers crossed! Thanks John for your bravery! Looks simply gorgeous my friend and a wonderful recipe!